The REVOLUTIONARY trial: A pilot study to assess the efficacy, durability, and safety of combination ranibizumab + peripheral scatter laser for macular edema secondary to branch retinal vein occlusion associated with peripheral nonperfusion on ultrawide-field angiography. Purpose: To determine the efficacy, durability, and safety of combination intravitreal ranibizumab plus peripheral scatter laser in patients with macular edema secondary to branch retinal vein occlusion associated with peripheral retinal nonperfusion on ultrawide-field fluorescein angiography. Methods: A 12-month, randomized, controlled, prospective, single center phase I/II study of 12 treatment-naïve eyes of 12 patients with visual impairment secondary to macular edema secondary to branch retinal vein occlusion associated with peripheral nonperfusion on ultrawide-field fluorescein angiography. Patients were randomized in 1:1 fashion to study and control groups. Patients in the study group received angiography-guided peripheral scatter laser treatment at baseline. All patients received six monthly intravitreal injections of ranibizumab followed by six months of observation with pro re nata treatment with ranibizumab if prespecified visual acuity or optical coherence tomography criteria were met. Results: At the 6-month primary outcome, both groups had significant improvement in mean change in best-corrected visual acuity (treatment: +16.8 letters v/s control +14.5 letters) and reduction in central foveal thickness (treatment: -207 μ m v/s control -241 μ m). Both groups also had an improvement at 12 months in mean change in best-corrected visual acuity (treatment: +19.1 letters v/s control +15.3 letters) and reduction in central foveal thickness (treatment: -282 μ m v/s control -281 μ m). The differences between groups were not statistically significant. In the 6-month observation period, the REVOLUTIONARY group had a statistically-significant fewer number of retreatments (median of 1 in the treatment group v/s 2.5 in the control group p=0.03), and there was a trend in the reduction of patients needing retreatment (67% in the treatment group v/s 100% in the control group, p=0.14). Conclusion: This pilot study suggests safety and durability of combination ranibizumab + angiography-guided peripheral scatter laser in treatment-naïve patients with macular edema secondary to branch retinal vein occlusion and peripheral nonperfusion on ultrawide-field fluorescein angiography. Further investigation is warranted to demonstrate the efficacy and long-term benefit of this treatment strategy. Anti-VEGF, branch retinal vein occlusion, combination therapy, laser photocoagulation, macular edema, peripheral nonperfusion, peripheral scatter laser, ranibizumab, REVOLUTIONARY, ultrawide-field fluorescein angiography. Retinal Vein Occlusion (RVO) is the second most common cause of retinal vascular disease leading to visual impairment after diabetic retinopathy . RVO is typically classified by the location of the occlusion as either branch RVO (BRVO) or central RVO (CRVO). There are approximately 180,000 cases of RVO in the United States alone each year, and the vast majority (approximately 150,000) are BRVOs . Macular edema is the major cause of vision loss in BRVO. The current gold standard for therapy of macular edema secondary to BRVO is treatment with intravitreal Anti-Vascular Endothelial Growth Factor (Anti-VEGF) agents as demonstrated in BRAVO with ranibizumab  and in VIBRANT with aflibercept . In these studies, patients received monthly intravitreal injections for the first six months, followed by subsequent injections if there was loss of vision or increase in central foveal thickness (CFT) on optical coherence tomography (OCT). The visual acuity and anatomical results were superior as compared to control groups, and they validate the VEGF pathway as a key therapeutic target in BRVO. Peripheral nonperfusion has been observed in patients with various retinal vascular diseases, including BRVO and CRVO by utilizing novel, commercially-available imaging systems for ultrawide-field angiography (UWFA) [5-12]. The long-term need for anti-VEGF injections to treat recurrent macular edema in many of these patients begs the question whether peripheral retinal ischemia may be driving VEGF production in the subset of patients with macular edema secondary to RVO associated with peripheral retinal nonperfusion. Furthermore, the peripheral nonperfused retina may potentially be a treatable source of the ischemia-induced upregulation of VEGF that may be driving the macular edema. In this small pilot study, we investigated whether treatmentnaïve patients with macular edema secondary to BRVO associated with peripheral nonperfusion on UWFA would have improved visual acuity, resolution of retinal thickening on OCT, and reduced burden of therapy by adding UWFA-guided peripheral scatter laser to anti-VEGF therapy. The REVOLUTIONARY (Branch REtinal Vein OccLUsion Treatment with scatter laser guided by ultrawide-field angIOgraphy in combiNAtion with Ranibizumab) studY trial was a prospective, randomized, controlled, single-center phase I/II trial (http://www.clinicaltrials.gov). identifier #NCT01247220) for treatment-naïve subjects with macular edema (ME) secondary to branch retinal vein occlusion (BRVO) associated with peripheral nonperfusion on ultrawidefield fluorescein angiography (UWFA). The study protocol and consent forms were approved by the Western Investigational Review Board. Patients meeting study criteria were identified at Retina Associates of Florida in Tampa, provided with informed consent, and enrolled. Subjects were randomized by the flip of a coin into study or control arms of the trial until study goal of 6 eyes in each group was met. Patients in the study group received UWFA-guided peripheral scatter laser treatment at baseline. All patients received six monthly intravitreal injections of ranibizumab followed by six months of observation with pro re nata rescue treatment with ranibizumab if prespecified visual acuity or optical coherence tomography criteria were met as per the BRAVO study . Subjects were eligible for enrollment if they had onset of symptomatic macular edema secondary to branch retinal vein occlusion of less than 12 months duration. Best-corrected visual acuity had to be between 20/40 and 20/320 (between 19 and 73 letters on ETDRS chart). Eyes had to be treatment naive and had to demonstrate areas of peripheral nonperfusion on ultrawide-field fluorescein angiography. Spectral-domain optical coherence tomography evaluation had to demonstrate areas of intraretinal fluid without vitreomacular traction or epiretinal membrane. Subjects had to be able to provide written informed consent and comply with study assessments for the full duration of the study and had to be at least 18 years of age. The ocular exclusion criteria for the study included previous intravitreous therapy (specifically triamcinolone, pegaptanib, ranibizumab, or bevacizumab), previous macular or panretinal scatter laser photocoagulation, and previous pars plana vitrectomy. Systemic exclusion criteria for the study included myocardial infarction or cerebrovascular accident within 6 months, pregnancy (positive pregnancy test) or lactation, or premenopausal women not utilizing contraception. The following were considered effective means of contraception: surgical sterilization or use of oral contraceptives, barrier contraception with either a condom or diaphragm in conjunction with spermicidal gel, an IUD, or contraceptive hormone implant or patch, participation in another simultaneous medical investigation or trial. On all study visits, patients underwent examination for medical history, vital signs, best-corrected visual acuity (BCVA) by a certified refractionist using the Early Treatment Diabetic Retinopathy Study (ETDRS) testing chart at 4 meters, intraocular pressure measurement with Tono-pen (Reichert, Inc., Buffalo, NY), anterior segment evaluation, dilated binocular ophthalmoscopy, and spectral domain optical coherence tomography (SD-OCT) (Cirrus, Carl Zeiss Meditech, Dublin, CA). At baseline, 3 months, 6 months, and 12 months, patients underwent ultrawide-field fluorescein angiography (UWFA) (Optos P200Tx, Optos plc, Dunfermline, Scotland, UK). Patients in the study group received UWFA-guided peripheral scatter laser treatment and intravitreal injection of ranibizumab 0.5 mg on Day 0, while patients in the control group received intravitreal injection with ranibizumab 0.5 mg on Day 0. Subsequently, patients in both groups received intravitreal ranibizumab 0.5 mg on months 1 – 5. On months 6-11, patients in both groups were eligible for intravitreal ranibizumab 0.5 if: 1) BCVA decreased by at least 5 letters, and/or 2) central foveal thickness (CFT) on SD-OCT increased by at least 50 μ m from the previous visit. Patients had a study exit evaluation on Month 12. Patients received scatter laser photocoagulation guided by UWFA late images. Image was available on computer monitor in laser suite. Photocoagulation was performed using a diode laser (Iridex,) using a contact lens slit lamp delivery system with spot size of 200 - 400 μ m, power of 200-400 mJ, duration of 200 milliseconds. Treatment was performed to cover the nonperfused retina and extend for at least one row posterior to the border of perfusion-nonperfusion. Adequate laser coverage was verified by comparing post laser image to pretreatment image (Figure 1). Figure 1: REVOLUTIONARY treatment strategy in right eye of patient with macular edema secondary to branch retinal vein occlusion in superotemporal distribution. Left: baseline UWFA demonstrating late leakage in the macula and peripheral nonperfusion superotemporally and Right: 12-month UWFA demonstrating no late leakage in the macula and peripheral scatter laser in distribution of nonperfused area superotemporally; there was progressive improvement in visual acuity and resolution of intraretinal fluid on OCT.
Aseptic technique was followed for every intravitreal injection. Patients received topical anesthesia (tetracaine 0.5%, Bausch & Lomb, Tampa, FL). Drops were instilled every 5 minutes x 3 instillations. A sterile, bladed lid speculum was used to hold lashes away from area of treatment. Topical 5% betadine was instilled to the conjunctiva prior to injection. Vision of counting fingers and intraocular pressure of less than 38 mm Hg were required before discharging the patient. Primary outcome for the study was mean change in BCVA in ETDRS letters at 6 and 12 months. Secondary endpoints included mean reduction in CFT on SDOCT at 6 and 12 months, percentage of patients requiring treatment due to recurrence of macular edema in the 6-11 month observation period, and mean number of injections in the observation period. Safety was assessed by recording ocular and systemic adverse events (AEs) and serious AEs (SAEs) by ophthalmic examinations, by patient reporting, and by changes in vital signs and laboratory parameters over the 12-month study period. Baseline characteristics of patients enrolled were fairly well matched between the two groups in terms of age, history of diabetes mellitus, history of systemic hypertension, and initial visual acuity. Baseline central foveal thickness on spectral domain optical coherence tomography was thicker in the control group (Table 1). Table 1. Baseline patient demographics and baseline characteristics. Mean initial ETDRS BCVA was 58 letters (20/70) in the control and 55 letters (20/70) in the Revolutionary group. Mean CFT on OCT was 539 in the control group and 464 in the Revolutionary group. The Revolutionary group had a mean improvement of 16.8 letters at 6 months and 17.3 letters at 12 months, as compared to 14.5 letters and 16.2 letters, respectively, in the control group. These differences were not statistically or clinically significant (Table 2 and Figure 2). Table 2. Visual acuity, optical coherence tomography, and retreatment. Figure 2: Plot of mean change in best corrected etdrs visual acuity in revolutionary and control groups. The mean reduction in CFT on SD-OCT in the REVOLUTIONARY group was 207 microns at 6 months and 222 microns at 12 months, as compared to 240 microns and 244 microns, respectively, in the control group. These differences were not statistically or clinically significant (Table 2 and Figure 3). Figure 3: Plot of mean central foveal thickness in revolutionary and control groups. There was a statistically-significant difference in the frequency of need for retreatment in the control group as compared to the REVOLUTIONARY group in the month 6–12 observation period (Table 2). 100% of patients in the control group required retreatment during this time period as compared to 67% (4 of 6) of REVOLUTIONARY patients (average time to retreatment=2 months). This difference demonstrated a trend but did not reach statistical significance (p=0.14), given the small sample size (Table 2). Of note, one of the patients in the REVOLUTIONARY group had chronic, untreated macular edema (10 months duration), and another patient required frequent treatments due to macular ischemia. This may have contributed to retreatment in these patients. The mean and median number of injections was 2.8 and 2.5 in the control group, and 1.3 and 1.0 in the REVOLUTIONARY group. This difference achieved statistical significance (p=0.03) (Table 2). There were no ocular or systemic adverse events in our patient population. No patients developed clinically-significant progression of cataracts or intraocular pressure increases necessitating treatment. No patients progressed to neovascular complications. There were no cases of endophthalmitis. There were no significant increases in systemic hypertension and no patients developed myocardial infarction or cerebrovascular accidents. Macular edema (ME) is the leading cause of visual impairment in Branch Retinal Vein Occlusion (BRVO) [1,2]. The goldstandard for treatment of ME secondary to BRVO is intravitreal injections with anti-VEGF agents [3,4]. Treatment with Anti-VEGF agents is rapid and effective in reversing macular edema and restoring vision. However, it frequently requires a prolonged course of injections, and, in many cases, discontinuation of treatment without recurrence of ME cannot be achieved. The likely reason is that although VEGF blockade is effective in reversing vascular permeability, the underlying pathobiology leading to the upregulation of VEGF in BRVO is not addressed with anti-VEGF injections. 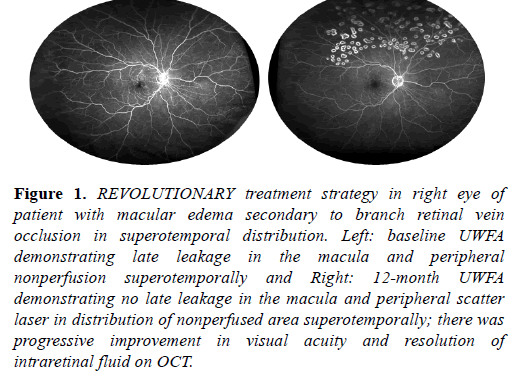 In this small, randomized, controlled pilot study of macular edema (ME) secondary to branch retinal vein occlusion (BRVO) associated with peripheral nonperfusion on ultrawidefield angiography (UWFA), both the REVOLUTIONARY treatment group and the control group achieved visual acuity improvements at 6 months (16.8 letters treatment v/s 14.5 letters control) and 12 months (17.3 letters treatment v/s 16.2 letters control). None of the patients suffered a loss of visual acuity at 12 months. Also, none of the patients progressed to neovascular complications in the study period despite the presence of peripheral nonperfusion on UWFA at baseline. There was also improvement in the central foveal thickness (CFT) on optical coherence tomography (OCT) in both groups with a trend for more reduction in the control group (244 microns v/s 222 microns at 12 months). This difference may be due in part to the thicker OCT CFT in the control group at baseline (539 microns v/s 464 microns) and the larger spread in the baseline OCT CFT in the two groups. The absolute CFT in both groups was fairly similar at 12 months (255 microns in the control group v/s 272 microns in the treatment group). Notably, the REVOLUTIONARY treatment strategy demonstrated a marked reduction in the need for anti-VEGF injections at 12 months as compared to the control group. While 100% (6 of 6) of the control patients required a mean of 2.5 in injections in the six-month observation period, 33% (2 of 6) patients required no further therapy in the observation period. While this demonstrates a trend towards a significant clinical benefit, this difference did not achieve statistical significance (p=0.14). This is of further importance given that one patient in the REVOLUTIONARY group demonstrated capillary dropout in the perifoveal area or macular ischemia at baseline and required 4 out of a possible 6 injections in the observation period. Another patient in the REVOLUTIONARY group had clinical ME for approximately 10 months prior to entry into the study and treatment. This result supports the hypothesis that this subgroup of ME secondary to BRVO may have an underlying pathobiology significantly driven by peripheral retinal ischemia, resulting in VEGF upregulation, and ultimately leading to increased permeability of the retinal vasculature in the macula. In other words, despite the efficacy of monthly injections of anti-VEGF agents for six months, the underlying pathobiology in this subgroup of BRVO patients is not reversed in the control group, leading to recurrence of ME in all six patients. As a result, treatment with this novel approach of combined peripheral scatter laser and VEGF inhibition may result in better durability, decreased burden of injections, and long-term control in this subset of patients, if not in all patients, with ME secondary to BRVO. The hypothesis for this study was that UWFA-directed peripheral scatter laser would address the underlying pathobiology resulting in macular edema secondary to vascular permeability, namely upregulation of VEGF induced by peripheral retinal nonperfusion and ischemia. This hypothesis has been explored in other retinal vascular diseases. Our group recently published a pilot trial demonstrating the benefit of this treatment approach in reducing the anti-VEGF treatment burden in patients with diabetic macular edema (DME) associated with peripheral nonperfusion on UWFA . Also, other authors have explored the benefit of this approach in reducing the extent of photocoagulation treatment in proliferative diabetic retinopathy [7,8]. A combination of UWFA-guided peripheral laser treatment and Anti-VEGF strategy has also been explored in the treatment of macular edema in CRVO with modest results [9-11]. The only other study to explore this hypothesis in macular edema secondary to BRVO was the RELATE Trial . In this study, there was a subgroup of 42 patients with BRVO that were randomized to 0.5 mg or 2.0 mg ranibizumab at baseline and after 24 weeks, re-randomized to pro re nata ranibizumab plus laser or ranibizumab alone. The authors found a reduction in mean BCVA at week 48 in the group that received peripheral scatter laser at week 24 as compared to the group that did not (-7.5 letters v/s +2.8 letters; p <0.01); there was also a reduction in BCVA in the group receiving laser at week 96 (-2.0 v/s +4.8; p< 0.03). There was no significant difference at week 96, and mean CFT on TD-OCT was not different between the groups at any time point. Furthermore, the authors did not observe a difference in edema resolution or a decrease in number of ranibizumab injections in the group receiving scatter peripheral laser at week 24 as compared to the group that did not receive laser. The major differences between our study and the RELATE Trial were that the REVOLUTIONARY patients were treatment-naïve on entry, and scatter laser treatment was performed on Day 0 as opposed to week 24. Two subjects in the REVOLUTIONARY treatment required more than one injection in the observation period: one had macular ischemia and the other was diagnosed 10 months prior to study entry. Outside of these, two subjects required no injections in the observation period and two required one injection in the observation period. It is possible that these differences impacted study outcomes. This pilot study was limited by its small size, moderate imbalance in baseline BCVA and OCT CFT between groups, and limited follow up. A larger study with longer follow up is necessary to validate whether combination UWFA-guided peripheral scatter laser with ranibizumab improves durability and reduces treatment burden in this subgroup of macular edema secondary to BRVO associated with peripheral nonperfusion. The authors received a research grant for this trial from Genentech Inc., South San Francisco, CA in the form of an Investigator Sponsored Trial (IST). The funding organization had no role in the design or conduct of this research. The authors have no proprietary interest in the material presented. Clinical Trial Registration – http://www.clinicaltrials.gov. Identifier: NCT01247220. IJS: Consultant for Allergan, Genentech, Optos, Regeneron, and Thrombogenics; Lecturer for Genentech, Regeneron; Research Support from Genentech, Ophthotech, Thrombogenics, Allergan, IAS: None, MCP: None, MEH: None, JT: None. Rogers SL, McIntosh RL, Lim L, et al. Natural history of branch retinal vein occlusion: an evidence-based systematic review. Ophthalmology. 2010;117:1094-1101. Klein R, Moss SE, Meuer SM, Klein BE. The 15-year cumulative incidence of retinal vein occlusion: the Beaver Dam Eye Study. Arch Ophthalmol. 2008;126:513-8. Brown DM, Campochiaro PA, Bhisitkul RB, et al. Sustained benefits from ranibizumab for macular edema following branch retinal vein occlusion: 12-month outcomes of a Phase III Study. Ophthalmology. 2011;118:2041-9. Campochiaro PA, Clark WL, Boyer DS, et al. Intravitreal aflibercept for macular edema following branch retinal vein occlusion: the 24-week results of the VIBRANT study. Ophthalmology. 2015;122:538-44. Friberg TR, Gupta A, Yu J, et al. Ultrawide angle fluorescein angiographic imaging: a comparison to conventional digital acquisition systems. Ophthalmic Surg Lasers Imaging. 2008;39:304-11. Suñer IJ, Peden MC, Hammer ME, et al. RaScaL: A pilot study to assess the efficacy, durability, and safety of a single intervention with ranibizumab + peripheral laser for diabetic macular edema associated with peripheral nonperfusion on ultrawide-field angiography. Ophthalmologica. 2015; 233:89-95. Reddy S, Hu A, Schwartz SD. Ultrawide field fluorescein angiography guided targeted retinal photocoagulation (TRP). Semin Ophthalmol. 2009;24:9-14. Muqit MM, Marcellina GR, Henson DB, et al. Optos-guided pattern scan laser (Pascal)-targeted retinal photocoagulation in proliferative diabetic retinopathy. Acta Ophthalmol. 2013;91:251-58. Spaide RF. Prospective study of peripheral panretinal photocoagulation of areas of nonperfusion in central retinal vein occlusion. Retina. 2013;33:56-62. Rehak M, Tilgner E, Franke A, et al. Early peripheral laser photocoagulation of nonperfused retina improves vision in patients with central retinal vein occlusion. Graefes Arch Clin Exp Ophthalmol. 2014;252:745-52. Singer MA, Tan CS, Surapaneni KR, et al. Area of peripheral retinal nonperfusion and treatment response in branch and central retinal vein occlusion. Retina. 2014;34:1736-42. Campochiaro PA, Hafiz G, Mir TA, et al. Scatter photocoagulation does not reduce macular edema or treatment burden in patients with retinal vein occlusion. Ophthalmology. 2015;122:1426-37.